Normalized Power came in at 368W which better represents the physiological cost of an effort over a course requiring constant changes in power output. As can clearly be seen above from the pink trace, due to the demanding nature of the parcours, Michi’s usual tightly distributed power output is nowhere to be seen. Indeed, the red arrow highlights just how broadly spread his power output was. This presents a very specific challenge to an athlete as being constantly on and off the gas puts a greater demand on the body’s glycogen stores and if not previously prepared for in training, will leave an athlete ‘inexplicably’ fatigued at the end of such a bike test, as I am sure many age group athletes found out when they started running! 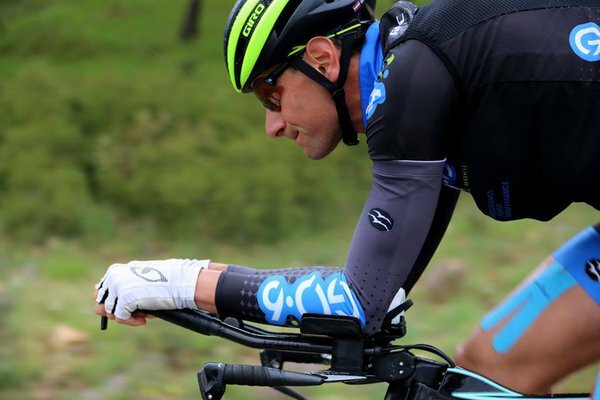 So while Michi managed to average his usual IM70.3 power output of around 350W, this would not have been possible were it not for a very intensive block of training on the bike in the weeks immediately prior to the race. Training which included many short efforts above his critical power (threshold) and up to maximal aerobic power combined with short recoveries between efforts in an attempt to better prepare his body for exactly the type of stochastic power distribution we can see above. Having tested Michi’s physiological capacities with power field tests, using the SRM to precisely mimic race demands in training is how sports scientists ensure that little is left to chance come race day – Fail to prepare, prepare to fail! As we can see, Michi spent much of his race in zones 1, 4 and 5. 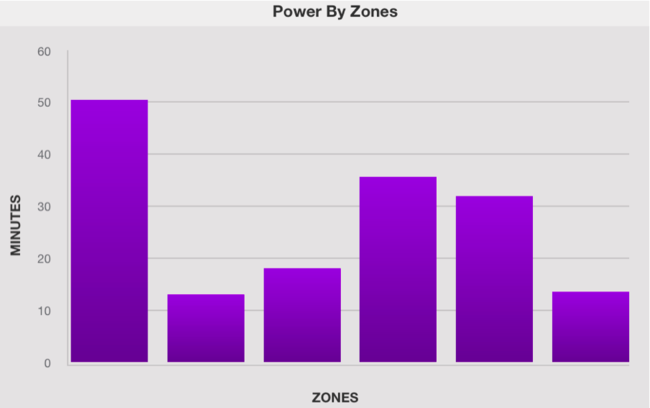 In other words, he was either on or off the gas with relatively little steady state Zone 2 or Zone 3 work. The fact that he was able to spend a cumulatively large proportion of his race at power outputs well in excess of his threshold (as shown by the last 3 bars to right) is a testament to the efficacy of his last training block leading into the race. The ‘dead time’ spent in Zone 1 is actually extremely small when considering just how technical a race course this is and how much time is spent on steep descents and in tight cornering. 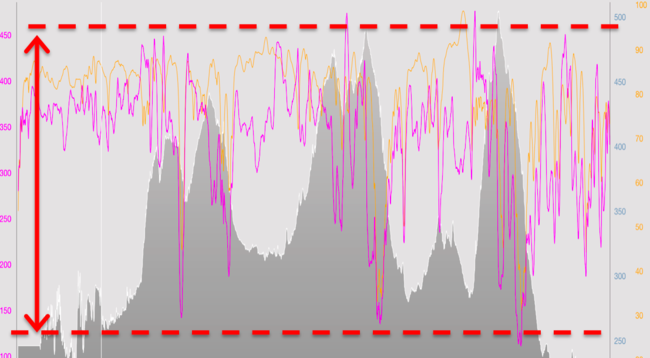 In the less well trained athlete, or even in the generally well trained athlete who has not optimised their energy systems for the very specific demands of a unique course like IM703Aix, I would expect to see more time (taller bars) in Zones 1 and 2 and less time in the intensity zones (3,4 and 5) which represent ‘supra-threshold’ work. The reason for this is that once an athlete’s work rate shifts from being supported by primarily aerobic metabolism to anaerobic, a period of recovery is needed before work can be resumed. This is sometimes referred to as ’burning a match’. Efforts like this should be avoided as much as possible in long distance triathlon as the process is very carbohydrate greedy and quickly depletes muscle glycogen. This should not be a problem for the average age group athlete using an SRM to pace their effort and avoid too many supra-threshold efforts. 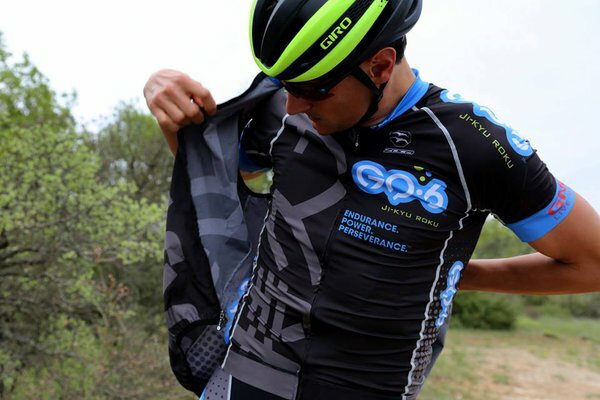 But at the pro level, carrying momentum over the short climbs to remain in contention will necessitate burning precious matches and thus having to rely on an anaerobic system, which had better be ready for it. Michi clearly had no problems there. 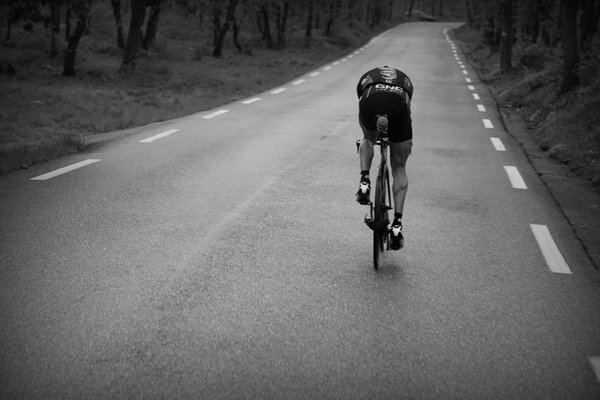 I am often asked how the pro athletes manage to average such a high power number over a 90km effort. 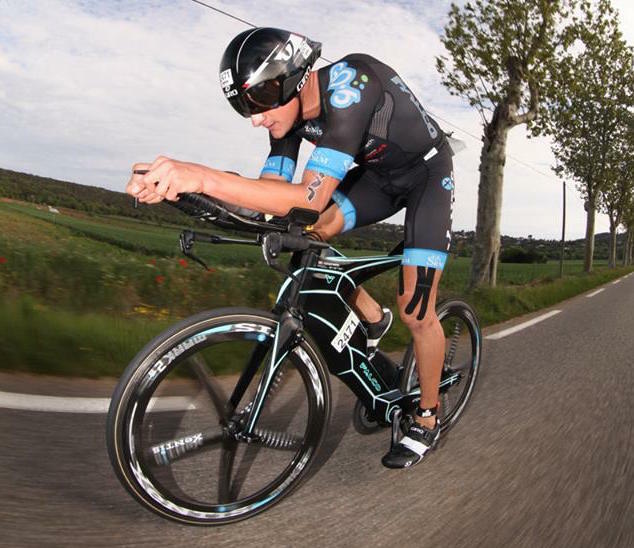 Michi, as one of the very strongest riders in pro triathlon averages around 350W, but even the less strong guys are able to hold onto an average of 280-320W for 2.5hrs. 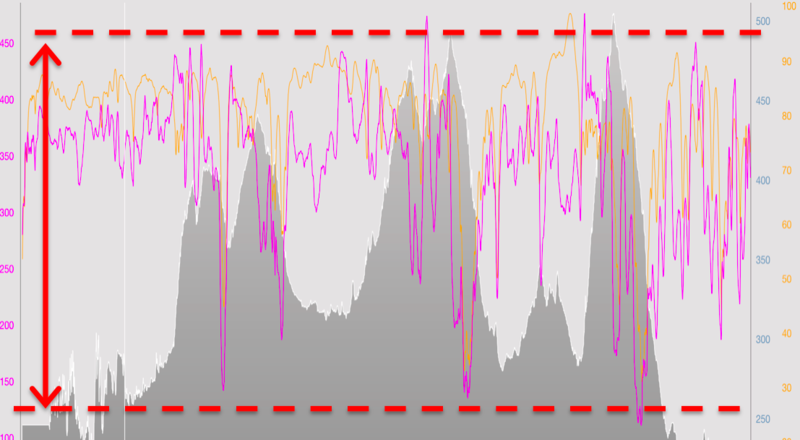 Compare this with a decent age grouper who will average around 200W. Now there are many reasons for this – training history, genetics, mental makeup and so on – but there is one area that age groupers can immediately improve on and this is by learning to stay on the gas on the descents as opposed to backing off and resting. Obviously there are times when the gradient is too steep or technical but take a look at how Michi dealt with the three main downhill sections below. 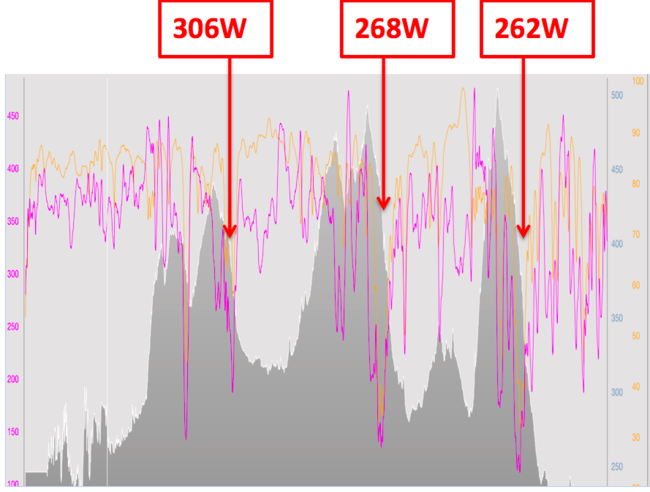 In each case, he increased cadence slightly from 83rpm to around 86rpm (orange trace) and kept the power (pink trace) up as much as possible. The numbers above represent his average descent power which is well above what most age group athletes will put out even on the steeper climbs! Learning to minimize power leakage in this way is a great way to improve your overall average watts and thus time. 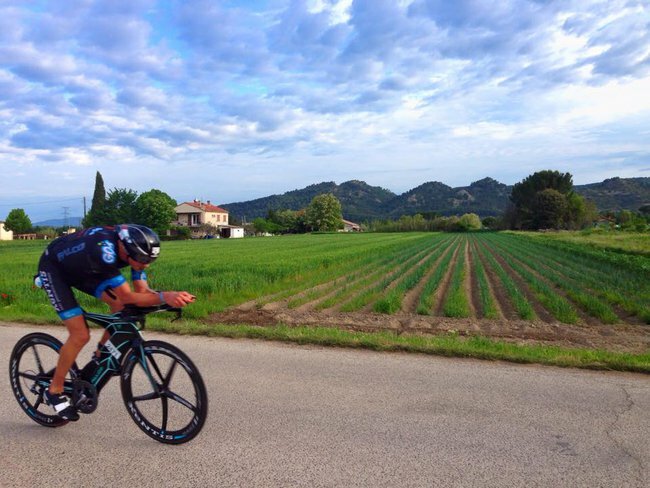 Just another example of how an SRM will make you faster! 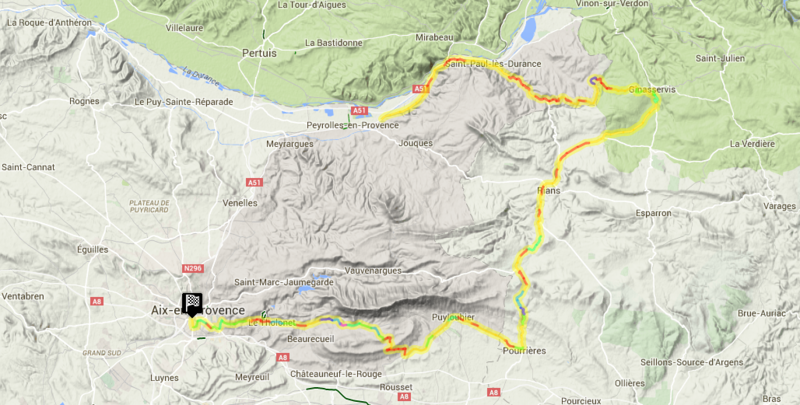 Michi’s average cadence over the entire bike leg was 83rpm. As pointed out above, he remains on the gas and thus pedaling continuously for the duration and his cadence distribution remains very tight, between 75rpm-88rpm. Yet 90rpm is often suggested as the most efficient cadence to aim for as a default. 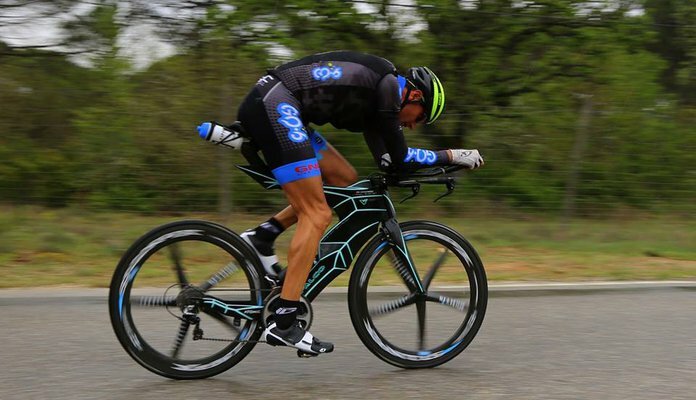 Well not only does one of the best cyclists in the world of triathlon patently not follow that guideline, but the most recent research on the subject has shown that cycling efficiency (ie lower heart rate for same power output) is improved when pedaling at closer to 80rpm whilst working at moderate (read 70.3 effort) intensity. 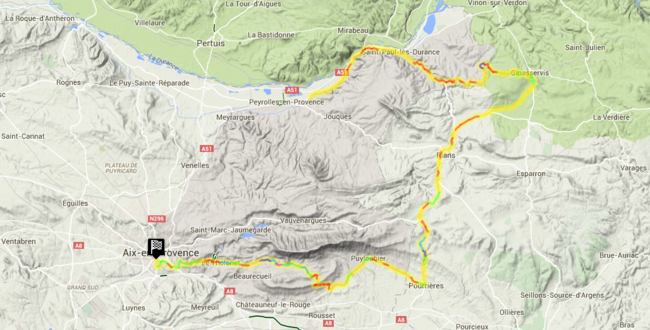 Try it for yourself by riding the same route on three separate occasions, all at your target race watts but at say 80, 90 and 100rpm. Upload the data and compare heart rate responses. You may surprise yourself. 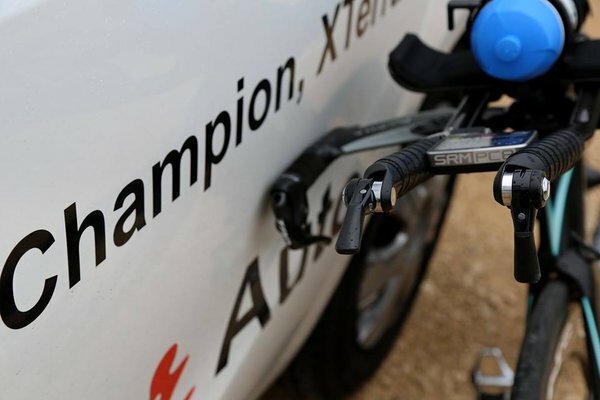 Yet another example of how acquiring an SRM is the same as acquiring performance!